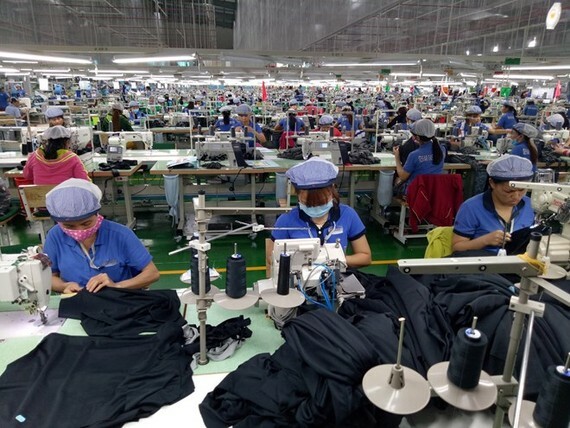 Vu Duc Giang, Chairman of the Vietnam Textiles and Apparel Association (VITAS), said at the conference that this is the highest rise over the past three years, compared with 12.1 percent in 2015, 4.07 percent in 2016, and 10.8 percent in 2017. In 2018, the export turnover of clothes hit US$28.78 billion, up 14.45 percent; while that of fabric was $1.66 billion, up 25.5 percent; and the export values of yarn reached $3.95 billion, up 9.9 percent, according to Le Tien Truong, General Director of the Vietnam National Textiles and Garment Group (Vinatex). The sector ran a trade surplus of some $17.86 billion throughout the year, representing a year-on-year increase of 14.39 percent. Giang said the VITAS has made proposals to the Government as well as relevant ministries and agencies in an effort to remove difficulties facing garment-textile businesses. The sector has seen rosy signs for 2019, with many businesses already receiving orders for the first six months and some even the whole year, with better product competitiveness and supply chains forecast. Besides, the new-generation free trade agreements Vietnam has joined will be put into place and are expected to exert positive impacts on the production and business activities of the sector. At the conference, the VITAS set the target of raising the export turnover to $40 billion in 2019, up 10.8 percent and bringing trade surplus to $20 billion, in turn ensuring jobs and raising incomes for 2.85 million workers. To that end, the association urged businesses to join hands in implementing solutions regarding investment, marketing, human resources development, and sci-tech application. It will also better perform its role as the bridge between member businesses and the domestic and foreign markets through trade promotion and cooperation activities, as well as between businesses and State management agencies to help remove difficulties facing firms at present. The association has proposed the State continue reforming administrative procedures, conducting inspections, and creating an open business environment for enterprises. The State should put forth policies to support waste water treatment at garment-textiles industrial parks, increase personnel training, and admit wholly foreign-invested enterprises into the association to develop the supply chain and promote experience exchange between members, it said.